Review: You have to get a fresh one. When you first smell this you become knocked out, in a good way. I LOVE this fresh, lemony, herbal smell. LOVE! It’s so lemony (but not in a fake or yukky Lemon Pledge way) that you can not believe it. This beautiful scent is made with Litsea Cubeba oil this plant is also known as the “May Chang” herb, it’s akin to lemongrass and it’s lovely, strong, bright, lemony smell. I just went on and on about the lovely, strong but real smell of them when I first got them. Such a refreshing scent as to be incredible…. The only drawback with the Lotta Iotta ballistic is that for some reason it’s loses half it’s glorious scent in the water. That’s the only reason this rating goes to a 3.5. Lotta Iotta is nice and softening though and soothing just like it says. I loved it because I have dry itchy skin in the winter time. It’s so softening and soothing to skin. Probably because of the oatmeal that is inside the ballistic, you can see the oats. Pity this didn’t make it for longer and that the scent didn’t stay longer as well. Sodium Bicarbonate, Citric Acid, Red Seaweed Extract (Carrageenan), Whole Oats (Avena sativa), Lemon Oil (Citrus limonum), Lemongrass Oil (Cymbopogan flexuosus), Litsea Cubeba Oil, Perfume. Lush Times Mid-Summer 2003 description: The Lotta Iotta contains a lot of iota seaweed. ‘So why is this significant, other than to make a rather bad pun?’, you may ask. 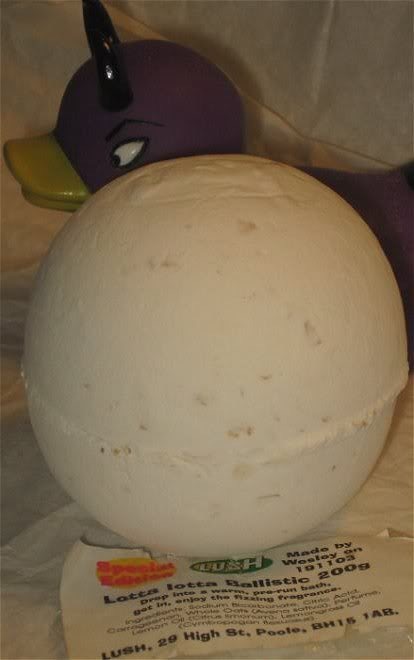 Well, in water, powdered iota seaweed extract dissolves into a soft gel that makes your bath water smooth and sensuous. It’s also a very nutritious plant, full of minerals. If that weren’t enough it also helps to soften the skin, as do the whole oats we put in there. As if that weren’t enough, we also scent this particularly luxurious Ballistic with a citrussy pack of skin-toning, mind-refreshing get-up-and-boogie essential oils, including invigorating lemongrass and revitalizing litsea cubeba, so with the Lotta Iotta you have the ideal energizing, reviving bath for getting both your mind and body ready for a day’s work or an evening out. Posted on March 10, 2017 by Lushalot	• This entry was posted in Uncategorized. Bookmark the permalink.